The Brazilian leader who has been dubbed the "Trump of the Tropics" made his first White House visit today, for a meeting with the US President. . Both leaders are fierce critics of Venezuela's socialist President Nicolas Maduro. Bolsonaro succeeded a leftist who at times had a frosty relationship with the United States. His insurgent, social media-powered campaign has been likened to Trump's 2016 effort. Like Trump, he painted himself as representing "the people" standing up against "the elite," blasted unflattering stories as "fake news," and mimicked Trump's "America First" catch phrase, pledging to put "Brazil First." Bolsonaro arrived with a large entourage that filed into the West Wing after him. The leaders had various meetings along with a working lunch, before holding a joint press conference. 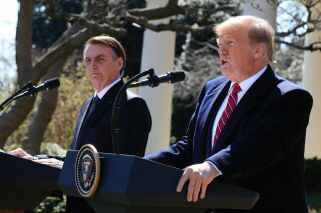 During the conference, the US President said that he is "very strongly" looking at US support for Brazil's effort to gain certain NATO privileges. Trump praised Brazil's President Jair Bolsonaro as the two sat down in the Oval Office, saying Bolsonaro has done "a very outstanding job." He also says Bolsonaro "ran one of the incredible campaigns" and is "honored" that it was compared to his. Trump said that Brazil and the U.S. have never been closer. Brazil has been seeking the status of "major non-NATO ally," which is a step short of full NATO membership. This title would allow certain financial advantages not available to other non-NATO members. Trump said that he was also supporting Brazil's effort to join the Organisation for Economic Co-operation and Development. On the subject of Venezuela, President Donald Trump said that "all options are open" when dealing with the crisis in Venezuela. He suggested that the United States could impose "a lot tougher" sanctions on the Nicolás Maduro regime if needed. The president noted the recent Venezuelan power outages and said "something terrible is going on down there" and that "we need to put an end" to the current dire situation. He added that the United States was "not looking for anything other than taking care of a lot of people." Bolsonaro expressed his thanks to Trump for sharing in his rejection of PC gender ideologies, respect of religion and disdain for fake news. ‘In conclusion, may I say that Brazil and the United States stand side-by-side in their efforts to share liberties and respect to traditional and family lifestyles, respect to God, our creator, against the gender ideology of the politically correct attitudes, and fake news,’ Bolsonaro said. Like Trump, Bolsonaro has been criticized for misogynistic, racist and homophobic attitudes. He showed support for pro-America and pro-Trump views during his 2018 election.